The Colorado Division of Labor Standards and Statistics recently announced that it is seeking input from the public on the Colorado Minimum Wage Order. These rules, which are revised annually to reflect the state minimum wage increase, regulate wage and hour requirements including hours of work, overtime pay, break periods, and acceptable deductions from wages. The state agency is specifically seeking input into who should be covered by the minimum wage regulations, including whether employees should be paid a minimum salary to be considered exempt from the rules. In 2016, Colorado voters amended the state constitution to increase the minimum wage. The law set up a series of scheduled increases to the minimum wage that began in January of 2017. Colorado will incrementally raise the state minimum wage to $12.00 per hour by 2020, after which it will rise relative to changes to the Consumer Price Index (CPI), which measures cost of living in the U.S. From January 1, 2019 to December 31, 2019, the Colorado minimum wage rate is $11.10 per hour. Employers in industries such as construction, manufacturing, and wholesale are not covered by the Colorado Minimum Wage Order, although they are still required to pay employees the state minimum wage rate if covered by the federal Fair Labor Standards Act (FLSA). 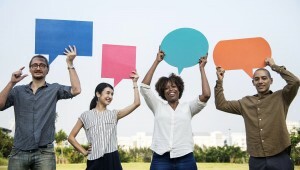 The Colorado Division of Labor Standards and Statistics asks stakeholders to express their opinions as to whether the categories of employees covered by the Minimum Wage Order should be expanded to include additional industries. The agency also asks whether Colorado should “implement a minimum salary required to be paid to employees covered by the exemptions in Section 5 of the Minimum Wage Order”. Certain categories of employee, such as administrative, executive, and professional employees, are already subject to federal regulations which require salaried employees to be paid at least $455 per week to be considered exempt from overtime pay requirements. (The federal salary threshold for overtime exemption may increase soon under new proposed regulations.) The Colorado salary threshold, however, would exempt certain categories of employees from all provisions of the Minimum Wage Order. Stakeholders are encouraged to specify whether there should be a minimum salary and, if so, what amount the minimum salary should be. 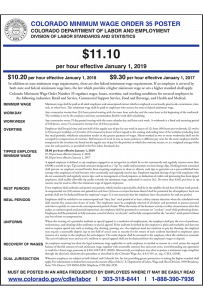 To submit comments on the Colorado Minimum Wage Order, send an email with the subject line “Minimum Wage Order” to the Division’s Rules Coordinator Michael Primo at michael.primo@state.co.us by August 16, 2019. The Division of Labor Standards and Statistics will also likely be holding public meetings to convene with stakeholders.